The Ulster Gardens apartments offer a comfortable yet stylish lifestyle right in the heart of the community. With a wide range of amenities and an efficient 745 square foot room plan, each airy one-bedroom apartment provides the perfect home for individuals and families. Ulster Gardens also offers a limited number of 2-bedroom and 3-bedroom units. 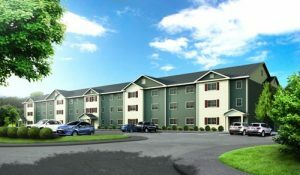 Nestled in a picturesque wooded setting on the east side of Kingston in the Town of Ulster, NY; this affordable apartment complex will be within easy access to major shopping centers, dining locations and state of the art Medical Centers. Each one-bedroom, two-bedroom or three-bedroom apartment will feature a large kitchen with eat-in area, spacious living room with study nook, sizeable bathrooms and bedrooms with ample storage. The community design offers energy efficient appliances, spacious community room for events and family gatherings, reading room and on-site laundry facility. Designed for affordability, and fully accessible for individuals with special needs, these apartments will be perfect for the active senior, veteran or family. For more information on these units in Kingston, NY and / or to find out what units are currently available to rent, please call our sales office at 845-514-2889 or click for an application. You will receive a letter informing you of the status of your application once it is reviewed. If accepted, your application will be placed on our waitlist. When your name is reached for consideration for an available unit, you will then be contacted to conduct an interview to continue the process of confirming your eligibility. You will then be asked to bring documents that verify the information stated on the application.